Theresa Newman is a clinical professor of law, co-director of the Wrongful Convictions Clinic, associate director of the Duke Law School Center for Criminal Justice and Professional Responsibility, and faculty adviser to the student-led Innocence Project. 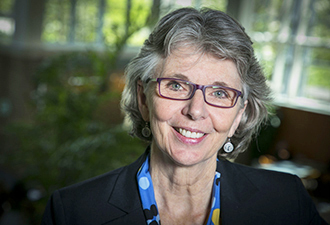 She has been at Duke since 1990 and served as the associate dean for academic affairs from 1999-2008. Newman is a member of the board of the international Innocence Network, an affiliation of more than sixty-five organizations dedicated to providing pro bono legal and investigative services to individuals seeking to prove their innocence and working to redress the causes of wrongful convictions. Until several years ago, she served as Network president. She has also served as president of the North Carolina Center on Actual Innocence, a nonprofit organization she helped found, which is dedicated to assisting wrongly convicted North Carolina inmates obtain relief, and a member of the North Carolina Chief Justice's Criminal Justice Study Commission (formerly the Commission on Actual Innocence), the North Carolina Chief Justice’s Commission on Professionalism, and the North Carolina Bar Association Administration of Justice Committee. Newman received her JD from Duke in 1988. She clerked for the Honorable J. Dickson Phillips, Jr., on the U.S. Court of Appeals for the Fourth Circuit after graduation and then practiced in the civil litigation group of Womble Carlyle Sandridge & Rice in Raleigh, N.C., before returning to Duke.